Clickin' Canines has 2 bay area workshops each year. People come from all over the state of California and from other states as well. We have a great time polishing up old skills and learning some new ones. The sharing between teams, the wonderful stories during lunch and final discussion time are often invaluable to all. Workshops are just that - we work hands on with the dogs. There is some lecture time during the 2-day sessions. Everyone leaves with renewed enthusiasm for training and with great new skills to add to everyday life. 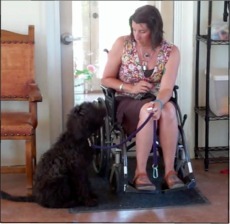 These sessions include assistance, hearing and medical alert dogs. We have discovered that working service dog teams together is exceptionally valuable to all - including the dog. Much is learned by this mixing of the pot! This is a concentrated and fairly intense day of working with your dog. We have a lot of fun and time for sharing and evaluating problems. We use video of what we have done and see what needs to be done to make things better. No dog or handler leaves with much energy leftover! Those benefiting from the longer venue are often newer teams, as well as teams that have come from elsewhere and did not get the benefit of much training. Trainers that are thinking about learning the service dog arena join from time to time and get a feel for whether it is something they would like to pursue further. There is more time for concentrated information through lecture and powerpoint presentations in this longer term, but the days are broken up with plenty of hands on work with the dogs.